Motorola has heard you loud and clear. Those who started screaming for the Motorola ATRIX 4G after seeing the Webtop dock available for the AT&T branded smartphone, have caught the attention of the manufacturer and its CEO Sanjay Jha. The executive announced at a Morgan Stanley conference that all future high-end Motorola smartphones shipped after June will have a Webtop dock available. The Webtop dock turns your smartphone into a laptop device and gives you a full desktop Firefox browser to work on with full-desktop like functionality. According to Jha, shipping Webtop on high-end Motorola smartphones is part of a plan by his company to become more software-centric. "We are trying to change the culture at Motorola to become a much more software-centric company," said the CEO, "One of the ways to do that is to bring entrepreneurial people with software skills into the company." The June start date means that those Verizon customers waiting on the Motorola DROID Bionic will not have the luxury of buying a Webtop dock-at least not immediately upon launch. Jha said that "time constraints" are the only reason that the dual-core powered device won't be shipping with the dock. On the other hand, the executive didn't say that a Webtop dock wouldn't be added as an accessory later down the road. 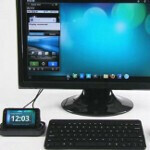 While the Webtop dock that is available for the Motorola ATRIX 4G is optimized for the Tegra 2 chipset on the phone, work has already started on getting the dock to work with the TI OMAP4 processor. The Motorola Mobility CEO also said that an upgrade on the Webtop dock to Firefox 4 will be available later this year. Beautiful. We are all one step closer to eliminating the need for desktops or laptops for the typical consumer/non-gamer. A portable SOC that simply plugs into your dock and turns your monitor and keyboard into a computer or laptop. Now they just need to increase the battery life, minimize the actual number of cores in use while it is a phone, and build an OS that will allow all the functionality of a basic laptop: word, excel. pwr pt, full internet, and all those silly programs that make my simple college laptop a necessary at this time. I imagine Microsoft would have an issue with Word, Excel and PowerPoint running on a non-Microsoft O/S. You might see some variation of Office running on a future edition of a Microsoft mobile O/S. But Android or iOS? Fuggedaboudit. I just listend to the full audio of Motorola's conference presentation, and it DID NOT say that the Bionic was getting Webtop. What was said was that time contraints kept the Bionic from getting it. It did not say that later the Bionic would get it! Sanjay said that high end phones shipping June and later would have it. Also, the Bionic is shipping with 512 Ram. This points to the Bionic not being offered the ability, but some newer phones JUNE and on, will have it. What that means to me is, WAIT until JUNE and Later to upgrade. Remember all the Razor Variants? Remember the Droid 2, Droid 2 global, and R2-D2 droid? A phone similiar to the Bionic will come with the Webtop! Would love to hear from some of the Atrix owners to see how the concept works on the trend setter. Any one heard about it or own one?